Sorry I haven't posted for a week. I was in the twin cities for four days last week and worked the rest. It was a great trip to see kids, grandkids, enjoy great restaurants and shop. While I was in the cities, I visited a Goodwill, and purchased this dated wood frame with oval antique style, mirrored photo holders. It was $3.99. I popped up the staples on the back of the frame, and took the glass out to clean thoroughly and also prevent paint from getting on the glass as well. If it was decent weather outside, I would have used Zinsser Bulls Eye Clear Shellac Spray , but since we are getting SNOW today, I used brush on Zinsser Bulls Eye Clear Shellac on my frame. 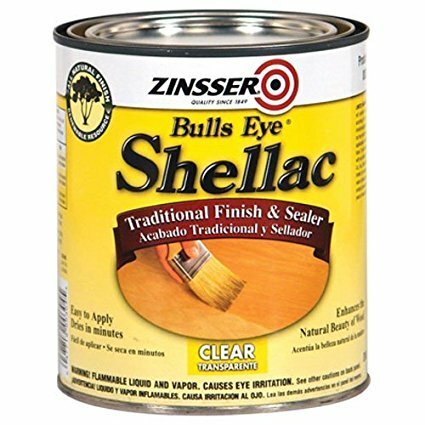 The shellac stops stain bleed through from stain to light paint. Sometimes you need several coats. Like when the stain is mahogany or old. After the shellac, I then brushed on two coats of Fusion Mineral Paint in Champlain . When I distress Fusion Mineral Paint, I do it right after the paint dries or it can be difficult to distress. I used 150 grit sandpaper to distress the edges and detail on the frame. I pulled out my Momenta Alphabets and Numbers Adhesive Stencil to add a name to my frame. I love these stencils and use them ALL the time. 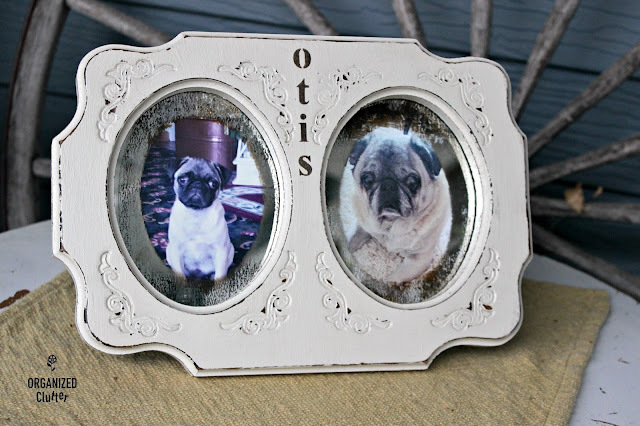 I used my stencil brush and Ceramcoat Acrylic Paint in Walnut Noyer to add the name "Otis". We lost our beloved Otis last February. He was the best dog ever! I sealed my frame with Varathane Crystal Clear Polyurethane, Water-Based Satin Finish . If you have ever loved a PUG, you know they love you back 100 times over! 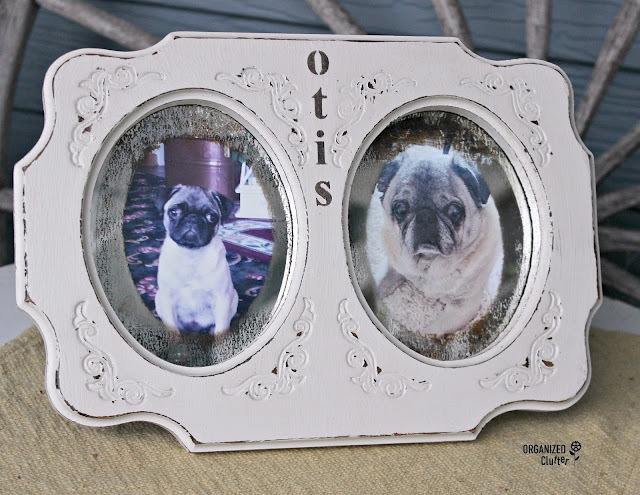 A lovely tribute to Otis. He looked like he was a darling dog. Thanks for sharing. Very cute frame - loveable face! We do miss our furbabies,don't we? Otis had such a sweet face. Such a good idea to use this frame for him. So sorry for your loss. Doesn't matter how long it's been, it still hurts. What a nice makeover, Carlene. And Otis looks like a very sweet dog. I bet you really miss him, but at least you can look at his picture now in this little frame.